Chang Cheh’s second generation of Venoms take over in perhaps of the best epic films of the Shaw Brothers universe in the 1980’s. Two rival clans, one led by Chief Hong and one led by Chief Yuan, compete to determine who will lead the martial world. When Yuan’s clan defeats Hong’s clan nine times, Hong sends in a secret weapon in Kuwada San, a master samurai. When the samurai defeats one of Yuan’s men, the defeated man kills himself as a sign of dishonor. However, when Liang Zhi-Sheng defeats the samurai using his bare hands, the samurai sends a warning to Yuan’s clan that Hong will have Kembuchi Mudou, a master ninja, help and throws a ring containing poison at Yuan, bruising his hand. This becomes the opportunity for Mudou to raid the Yuan’s headquarters by challenging the clan to face off against his Five Element Ninjas. All but young Tian-Hao and Zhi-Sheng take on the challenge as these two are tasked with protecting the headquarters. However, the remaining members of Yuan’s clan are viciously murdered at the hands of Mudou and his ninja brigade. Even more, Mudou sends in a kunoichi named Junko to infiltrate Yuan’s base by seducing Zhi-Sheng. When Mudou and the ninjas raid the base, Tian-Hao is captured but makes his escape to find an old master who is skilled in ninja. Together with the master’s three veteran students, Tian-Hao now makes the challenge to take on the Five Element Ninjas. During the waning days of the Shaw Brothers, Chang Cheh unleashed his second generation of his famous Venoms team, which consisted of Ricky Cheng, Wang Li, Yu Tai-Ping (Chang’s godson), Chu Ke, and Lung Tien-Hsiang as they would team up on a number of films with some of the first generation Venoms team. Here, Lo Meng would be the only first generation Venom in the cast and shows that “big brother” character on the screen as Zhi-Sheng. Leading the way in this film, however, is Taiwanese-born Ricky Cheng in his lead role debut. And what a damn good one it is. The usually supporting actor and occasional action director, is in top form as Xiao Tian-Hao. Tian-Hao is the typical rebellious brother of sorts. While he is a good fighter, he tends to be occasionally cocky and arrogant. While his suspicions about a character prove true, he begins to suspect it by acting cold-hearted towards her as a way to “blow her cover” but naturally, it proves too late. It has been clear that Chang Cheh was more into the “male dominance” of kung fu cinema, but to have Chan Pei-His’s Junko using the distress as a cover for her true motives is somewhat a way to say that perhaps he may have begun to accept the potential impact of women in martial arts films. There is a subliminal “love triangle” between Cheng, Chan, and Lo’s characters with the two men unknowingly involved until it it too late. Ricky Cheng and co-star Chu Ko are the film’s action choreographers and it is clear that they know their stuff. This film has perhaps some of the best weapon fights mixed in with Chang’s use of blood and at times, gore. In one very disturbing scene, the Earth ninjas attack a member of Yuan’s clan from below and as the Yuan clan member fights on, you can see his innards slowly seeping down. 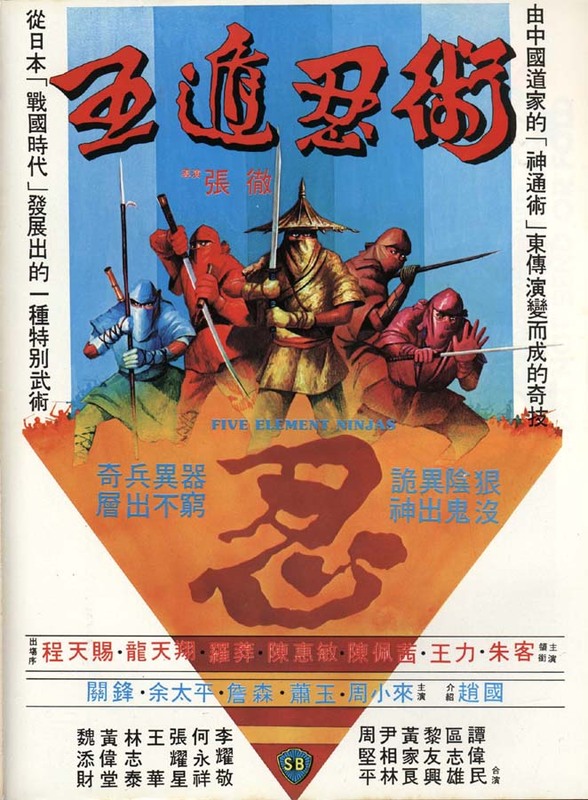 The awesome climactic battle, in which Tian-Hao is now joined by new friends Li Ying-Wu, Huang Fat, and Chen Jun in taking of the Five Element Ninjas is just great to watch. The four have a battle-axe like weapon that consists of numerous weapons that prove to be very useful and the fights are just spectacular to watch. Five Element Ninjas is definitely an 80’s Shaws epic, driven by the performance of Ricky Cheng as well as his fellow second generation Venoms. The fight scenes are exciting to watch, even if they tend to have buckets full of blood in the midst. Still a wonderful kung fu classic to this day! A Shaw Brothers Co. Ltd. production. Director: Chang Cheh. Producer: Mona Fong. Writers: Chang Cheh and I Kuang. Cinematography: Nico Wong. Editing: Lee Yim-Hoi and Chiang Hsing-Lung. Cast: Ricky Cheng, Lo Meng, Chan Pei-Hsi, Lung Tien-Hsiang, Michael Chan, Wang Li, Yu Tai-Ping, Chu Ko, Kuan Feng, Chan Shen, Cheung Yiu-Sing, Chow Siu-Loi, Siao Yu, Lee Yiu-Ging, Chiu Kwok, Wong Wa, Lam Chi-Tan, Ho Wing-Cheung, Wong Wai-Tong.